we have a cancellation policy of (flexible) refund on the booking deposit or booking fee for a cancellation, no show or reduction in numbers. 4-for learning LANGUAGE COOKING ,FOLK DANCE(KALBELIYA) AND MUSIC, PAINTING AND YOGA. Amar Niwas Guest House is a long standing, family run establishment that occupies a 529 years old multi-story haveli in the oldest part of Jodhpur, Situated on the foothills of Mehrangarh Fort, Guest House is 5-minute walk from Fateh Pol, one of the gates to the fort complex. 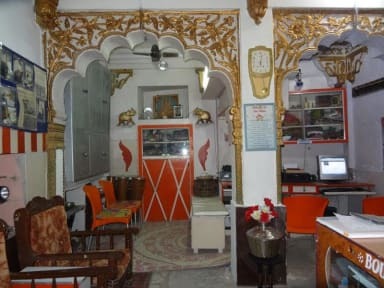 The heritage guesthouse features stone carvings and wooden ceilings Room maintains many of its original features beautiful jharokha's with panoramic view of the fort, old city wall.Rooms are very basic, Cooled with a fan. clean bed with a small seating area , attached and share bathroom with hot/cold shower facilities. Amar Niwas houses a restaurant which serves Indian delights alongside Continental dishes. The accommodation features air conditioning, laundry services and car rental, requests on an additional charge. We also welcome groups of a maximum of 18 people. Wonderful guesthouse hosted by wonderful people. Fabulous Gueshouse and great family!!! You feel like at home from the beginning. They also have fantastic food and everything is very clean. It's located only 5 minutes by walk from the Fort. I can reccomand these Guesthouse to everybody!!! The owners are very kind. They can advice you about the best places to visit in Jodhpur. You do not need a guide. They make sure that you feel comfortable. The rooms are fine and the prices are good. They also have nice local food and good te. Very nice and very friendly people. Nice room and good view from the roof. Loved our stay. Suni and Nina are nice and love to chat. The rooftop view is beautiful. I really enjoyed my stay here. The place is right in the heart of the blue city so it's in an ideal location for exploring Jodhpur. it was clean and comfortable. We stayed only two night, the area is good. Beautiful view of the city, you can easily reach the clock tower and the rail station by foot. The owner was really helpful even if he was a bit sick those days. Recommended it. The family are lovely. The location is perfect and the food and tea is wonderful. The rooms are what you pay for, the walls were thin and there’s a window on the inside so you could hear the family in the kitchen cooking or chatting. You can hear outside very clearly too. But other than that it’s a nice place to stay. The hosts are a lovely family. FYI: It took forever to check-in. The room was plain but had windows with beautiful views. The rooftop view is one of the best in the city. We were offered meals but we didn't eat in. It was excellent value. We walked around at night and felt totally safe. The family is very welcoming, nice and charming. The food is very good!! The family helped us arranging a bus. It is a historical building with characteristic features and therefore do not expect any luxurious room. However, we do need to mention that the room is not clean at all. Jodhpur is a dusty city so expect a dusty homestay, but besides the dust the room was not clean and the shower didn't work properly.